D*Face has always had a sense of meaning and something to say, especially on the topic of the personal becoming public and speaking for an entire community. This can be seen in his characteristic make-believe canine, D*Dog, that flies away, free and unstoppable. The D*Dog is a kind of balloon with wings that flap in the wind, a lolling tongue and large bared teeth, an anthropomorphic creature that rejects the status of daily routine and regimented rules, a typical adolescent trait. 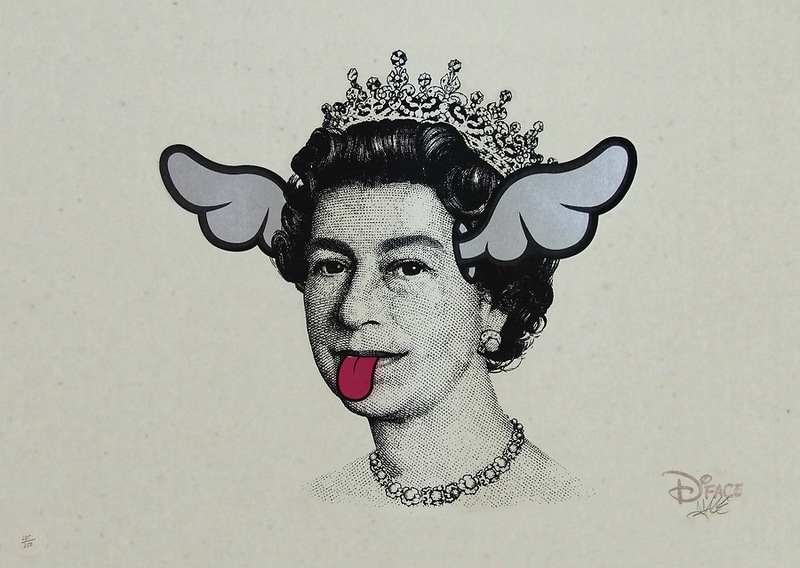 The D*Dog and its mutation into Queen Elizabeth (with wing ears and canine tongue) is an eloquent example of D*Face's poetics. They are two sides of the same existential condition: grassroots creatively that comes from below and takes flight, and the public icon which from on high - and often through various media channels - imposes codes of conduct, points of view and dictates styles and fashions. And for this reason it must be criticised, contested, weakened and reduced to a simple, fictional, child-like doodle.